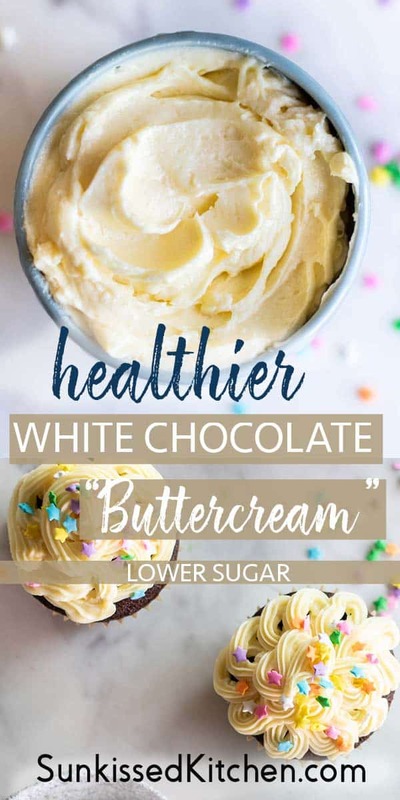 If you’re looking for a healthier way to frost your cupcakes, this Healthy White Chocolate Buttercream Recipe is for you! I avoid traditional frosting recipes that are made mostly of sugar — and come up with creative ways to make “frosting” out of higher protein ingredients. 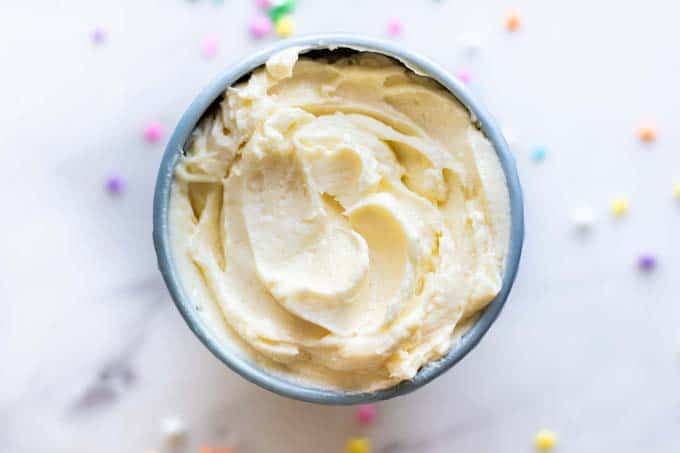 This healthy cream cheese frosting only uses 2 ingredients! Now that I have a 3 year old, I make cupcakes a lot more often than before! With little ones around, there is always something to celebrate. I love making treats like healthier, low sugar cookies, or desserts entirely sweetened with dates — but toddlers, they are on to those kinds of tricks. The healthier desserts worked when he was a baby, but at this stage, he dissects everything I had him and if there is a whole grain visible, it’s off the menu. No thank you, mom! 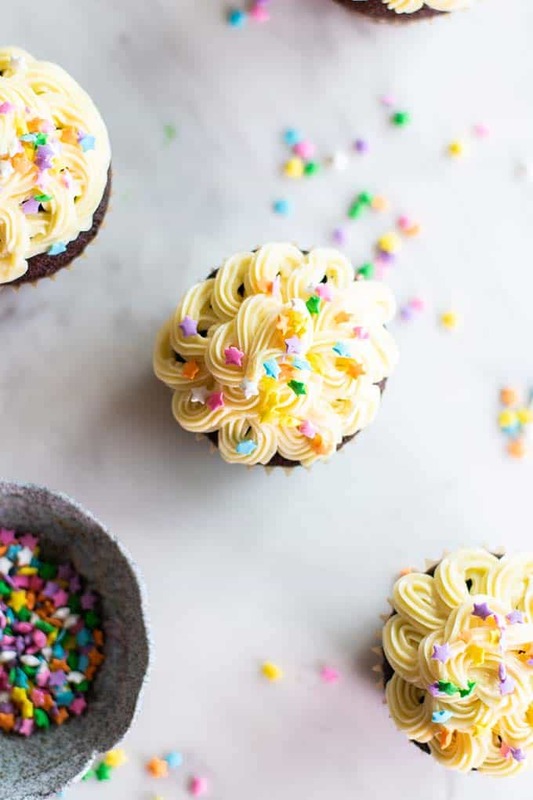 So I am often looking for creative ways to make healthier low sugar frosting. If you’re looking for a fun and different chocolate frosting, you might love my Healthy Chocolate Frosting made with a super — uh, unexpected — base. (it’s not tofu!). For our little celebration last week, I wanted white icing. I’ve made just plain honey sweetened cream cheese icing in the past, but it doesn’t pipe well if it’s at all warm outside (or inside). I wanted a solution that would make a fool-proof icing that would pipe well, look beautiful, and also pass the toddler test. Now, white chocolate isn’t an ingredient I use often because — it’s not chocolate! I like the real dark stuff. But it works perfectly in this recipe! 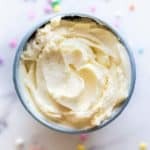 If you buy high quality white chocolate, you benefit from the the good fats in the cocoa butter, plus it has all the sweetness you need to make this two ingredient frosting. Once the white chocolate is melted, just drizzle it over some cream cheese, and use a hand mixer to really mix it well. 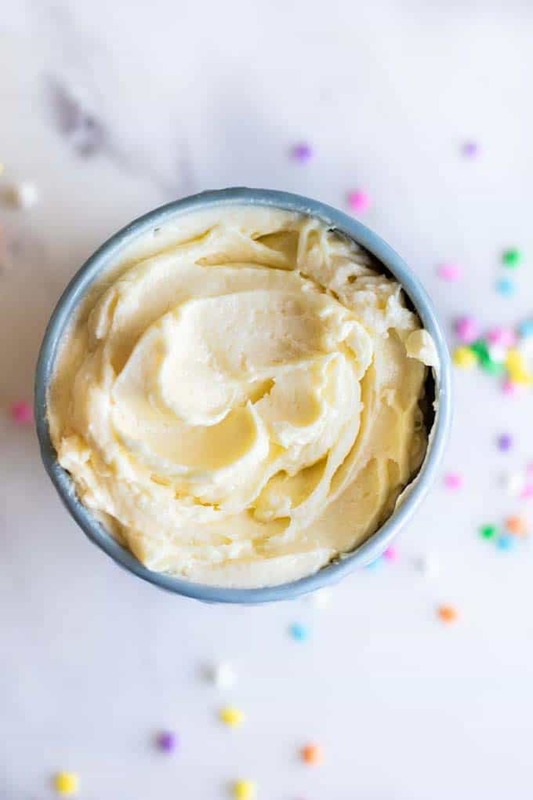 While honey softens the cream cheese, the white chocolate will begin to harden when mixed with the cream cheese, meaning it results in the perfect consistency to pipe onto cupcakes or ice a cake. This frosting turns out just as creamy and fluffy as buttercream, only without any butter or powdered sugar. It’s not sugar free, but it is much lower in sugar and higher in protein than a typical frosting. The amount of frosting you’ll need to generously ice 1 cupcake only has 6 grams of sugar. A regular buttercream frosting has 19 grams of sugar! 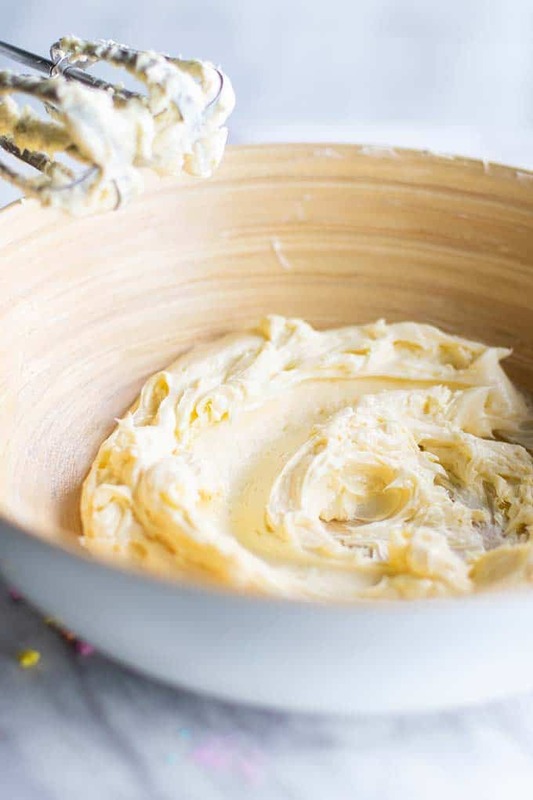 And I promise — adults will love this buttercream alternative as well! Less sweetness is often appreciated! This simple 2 ingredient frosting is similar to a buttercream -- but made with no butter or powdered sugar! A healthier frosting that is higher in protein and lower in sugar. 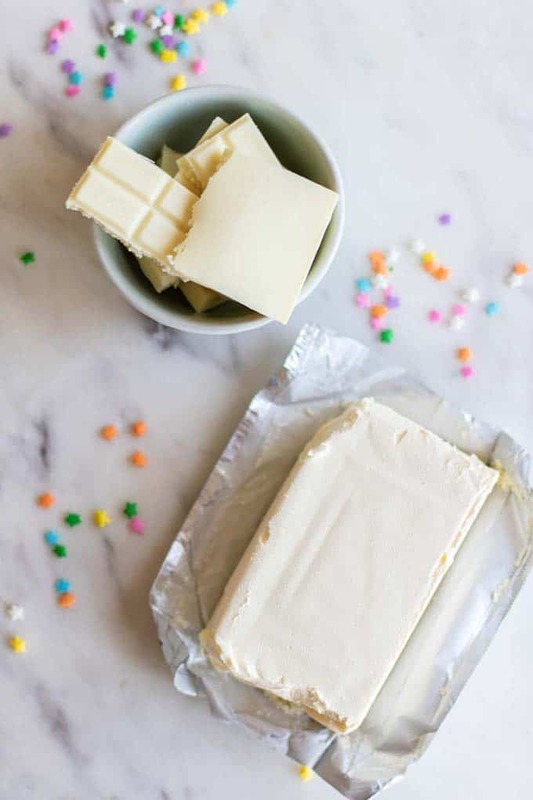 Melt the white chocolate in the microwave. To ensure it doesn't burn, heat gently for 20-30 seconds at a time, stirring in between, until melted. 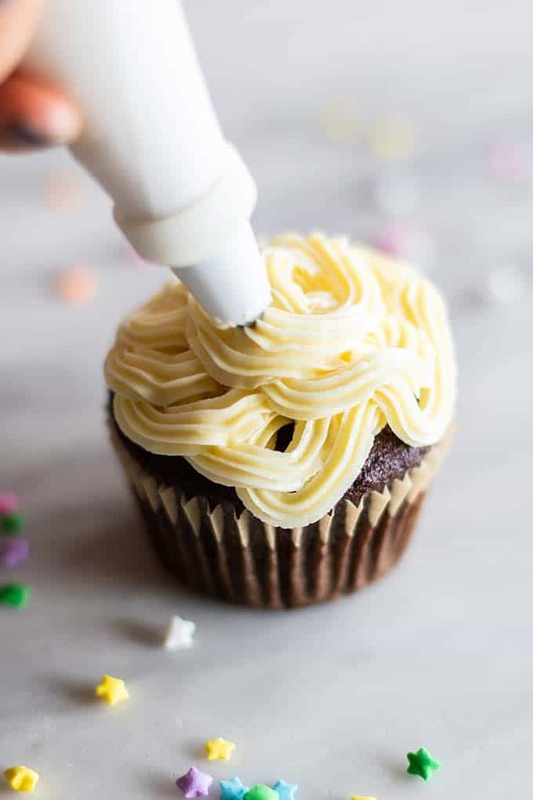 This Healthy Buttercream Frosting post may contain affiliate links, meaning if you make a purchase, I will receive part of the sale as a commission. This helps me continue to bring you lots of fresh and inspired recipes!